Materials such as better porcelains and adhesives allow Dr. Bhakta to repair and restore badly broken teeth without resorting to traditional methods like crowns, which can destroy over 70% of the tooth’s natural structure. To make a crown, dentists must grind away the majority of your tooth structure, going below the gum line, most of the time cutting unnecessarily beneath the enamel into more fragile dentin and much closer to the nerve than needed. With minimally invasive dentistry, Dr. Bhakta ensures the same excellent work of removing decay occurs while taking away as little of the tooth as possible. Dr. Bhaktas tooth preparations always stay above the gum line. These restorations are just as, if not more, durable than crowns and have been proven effective in countless studies over the last 20 years. The same goes when he places veneers. It is entirely possible for veneers to be only fractions of a millimeter in thickness, both preserving the majority of your tooth and yet still maintaining the ability to completely transform your smile! The expert use of veneers and onlays not only preserves your natural tooth structure, it also can restore your smile with superior dental esthetic results as well. Why is it important to preserve as many of your teeth as possible? Our Dental FAQ explains it ! Dr. Bhakta wants people to know that keeping the basis of their dental foundation is the best thing they can do for their dental health. There is simply no need to completely replace your teeth with unnatural materials. Dr. Bhakta works with the latest, super thin dental materials so that he can keep as much of your tooth as possible. Of course, people may not be able to hold on to a tooth and may need dental implants. There is absolutely nothing wrong with dental implants. Dr. Bhakta wants to work with what you’ve got. The cost of great dentistry in the hands of a skilled artist does not vary from patient to patient. Dr. Bhakta provides beautiful dentistry to everyone, no matter whether they are a celebrity or not, and at the same price! 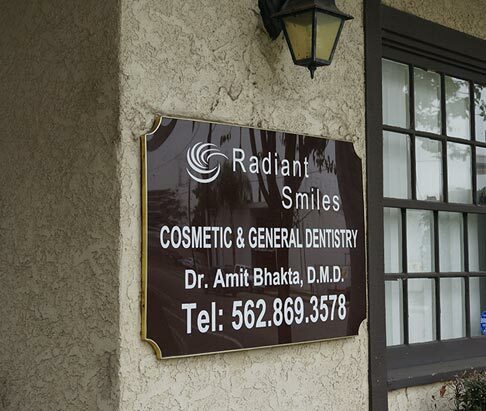 Pricing for dentistry with Dr. Bhakta is based on your procedure. EVERYONE is treated with respect, care and kindness. And the best part, our team makes sure that you can afford your gorgeous, new smile! Our dental FAQ only strives to give you some basic information. We offer a dental FAQ streamlined for you. All you have to do is call us!